Imagine The Lights From Hundreds Of Candles Flickering On The Water. 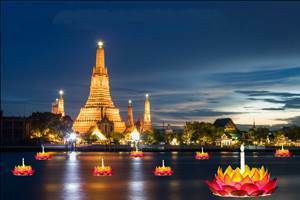 Welcome To Loy Krathong, One Of The Most Picturesque Festivals In Thailand. Each Year On The Night Of The Twelfth Lunar Moon, People Gather Round Rivers, Lakes And Canals To Pay Respects To The Goddess Of Water By Releasing Intricately Decorated Lotus Rafts Onto The Water. Celebrate Loy Krathong With Riva Surya To Forge Unforgettable Memories Of This Magical Time In Thailand.